More than anything, I have learned a great deal about the amount of hard work and dedication that it takes to be a champion. 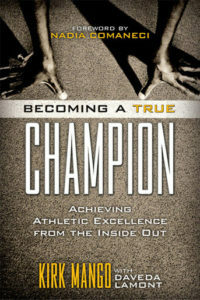 That is why I am happy to support and recommend this book, Becoming a True Champion, by Kirk Mango with Daveda Lamont. I have known Kirk for many years. As a fellow competitor, I know how hard Kirk worked to become an NCAA champion. Now, as a parent, coach and gym club owner, I can attest to the fact that we need more coaches, teachers, and mentors like Kirk Mango. Becoming a True Champion is more than an expert lecture on the keys to sports success, it is a hands-on manual which gives readers practical exercises to help them become the best they can be. Mango has ‘nailed it’ with this book. This is a very insightful book that is extremely beneficial for an athlete of any level. I found this book to really encompass the trials and dedication it takes to give yourself that best opportunity to be successful, not only in sports, but in life. I will draw on the messages in this book as I make my way through the minors with the ultimate goal of making the big leagues. It is definitely a must-have for any young athlete. I read it, I loved it, I live it. As a professional athlete in the NFL I’ve made many sacrifices in my personal and athletic life. Becoming a True Champion is an inspiration even to me now. It’s a great reference for the passionate athlete willing to make sacrifices to achieve true greatness. One of the reasons I attended Northern Illinois University was because Kirk Mango went there. I was a still rings and pommel horse specialist and [he] was a NCAA national champion on still rings. Although Kirk had graduated just before I began my college career, I heard many great things about [him] and his incredible work ethic. All these years later, I was honored when he asked me to review this book. It is clear that Becoming a True Champion represents the fruition of Kirk’s successes throughout his entire career. My goal in life is to inspire others, and with this book, Kirk Mango has certainly inspired me. Becoming a True Champion is not only his story of success in gymnastics, but it is a guide for all athletes in any sport to fully understand what it takes to become a premier athlete. Wonderfully written, this book is a step-by-step process to success in sports. 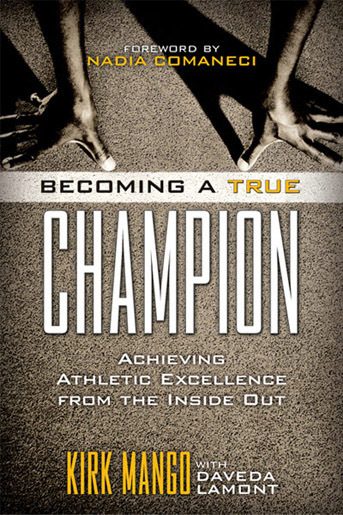 Kirk is careful to explain the hard work, effort and dedication that it takes to become a “true champion.” I highly recommend that any athlete who wants to succeed in his sport must read Becoming a True Champion. Kirk, you have done it again! Each year thousands of young men and women compete to become high school state champions in various sports. At the collegiate level the competition is even more intense. Author Kirk Mango achieved his championship in gymnastics, a discipline that requires great courage and discipline-both physical and mental. As young men and women set their sights on a championship, they ask themselves “what it will take to become a champion?” Kirk Mango provides a clear answer to that question and at the same time takes the concept of “champion” and extends its meaning into life beyond the athletic arena. Mango addresses what it takes for a person to become a true champion, a champion at life. Kirk Mango’s book should be in school libraries everywhere. His actual experiences as a championship athlete and firsthand knowledge of today’s teens as a coach make his advice especially relevant. Having worked with Kirk and his students, I know the impact of the message of this work on a variety of students. Many of his students have told me that his approach to teaching has made a tremendous difference in their lives. He has provided the foundation for helping them to achieve their aspirations, not only as athletes but as individuals with good character. At a time when direction and inspiration is sought so desperately by many teens, this book provides the guidance they need to become true champions. After working with great teenage athletes over two decades, I have found a must-read book, Becoming a True Champion: Achieving Athletic Excellence From the Inside Out by Kirk M. Mango. This book accurately describes a path that teenagers and their parents can follow to achieve greatness in the teen’s personal and athletic life. The book illustrates and sets a road map that will enable teenage athletes to achieve both their athletic and personal goals. The uniqueness of this book lies in its involvement of the athlete’s parents and family and in clarifying how their role is critical to teenagers’ success. This is a great book. It was very motivational and I couldn’t put it down. It has the kind of information in it that every young athlete should read and get to know. It’s especially appropriate for those athletes who are on the brink of greatness–I wish there had been a book like this when I was training. This book contains the kind of things that I heard from all of the coaches throughout all of my years as a competitive athlete. It’s great that it’s all organized into one book. Even better, all of these things end up getting tied together. Through relevant examples, inspiring stories, and a personalized approach, this book shows athletes how to avoid the many pitfalls, and overcome the inevitable obstacles, so common in today's sports culture. What’s a True Champion Look Like? Watch This!